Delhi Subordinate Services Selection Board released the DSSSB Teacher Recruitment 2018 Notification on 26th June 2018. DSSSB Board recruiting the Jobs in Municipal Corporation Of Delhi of a total 4366 Primary Teacher Jobs through dsssbonline.nic.in in Online over the period of 02nd to 30th July 2018 and the Contenders may register for this Delhi SSSB Primary Teacher Jobs very fastly after referring the notification. Delhi Subordinate Services Selection Board is responsible for the advertisement of DSSSB Teacher Recruitment 2018 for providing the Job Opportunity for the 4366 Primary Teacher Jobs in Municipal Corporation Of Delhi. Freshers and Experienced in Teaching Field may Apply for this Delhi SSSB Teacher Recruitment 2018. First of all the Contenders need to check out the Details placed on the DSSSB Teacher Notification once to find the Eligibility and then Apply to this DSSSB Teacher Jobs Online at dsssbonline.nic.in as the application link will commence from 02nd to 30th July 2018. DSSSB Board Officials will complete the selection through Online Exam. So, aspirants need to refer to Previous Papers for the Preparation. Applicants must have the Maximum age limits of 30 Years as on date, and Age Relaxation to all the Reserved category is applicable as per norms. Payment OF Fee as per the Category wise which is specified here where the Fee is Non-Refundable must be paid by the Applicants. Delhi Subordinate Services Selection Board Officials will commence only Online Written Test For selecting the Candidates. Contenders will get the Salary per month is Rs.35,400/- (Revised) and Generally, it varies in the range of Rs.9/300/- to Rs.34,800/- and Grade Pay of Rs.4200/- as per Pay Band Matrix level 2. DSSSB Recruitment 2018-19 Notification is issued up to 9232 Vacancies of Special Educator Teacher, Assistant Teacher (Nursery), Assistant Teacher (Primary), Physical Education Teacher, Drawing Teacher, Domestic Science Teacher, PGT (Home Science)-Female, PGT (Physical Education), PGT (Fine Art)-Male & Female, PGT (Music)-Male & Female, PGT (Biology, Chemistry, Commerce, Economics, English, Hindi, History, Pol.Science, Sanskrit, Geography, Maths, Physics, Punjabi, Urdu, Agriculture, Sociology), TGT (English, Maths, Natural Science, Social Science, TGT (Bengali, Hindi, Punjabi, Sanskrit, Urdu), Educational and Vocational Guidance Counselor (EVGC)- Male & Female, PGT Computer Science- Male & Female Jobs at the main website @dsssbonline.nic.in, can apply online from 05th Jan 2017 to 31st Jan 2018. Read the full details well. DSSSB Notification 2018: Again a wonderful central government job opportunity which is an unexpected one.That is the DSSSB PGT Notification 2018 with a good number of vacancies that is 9232 Vacancies.Do you think it is fake no its not .It is true .You can confirm this recruitment by checking in the official notification .You can also see that official site link in our site only.So what you have to done to check this notification is find the official site link and visit that official site.After that you can trust this recruitment notification.Your trusted site we not give you the false updates about any notification.After verifying all the details with the official notification only ,we will update that details in our site Jobschat.in. 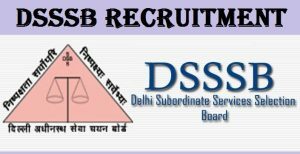 DSSSB 9232 Jobs Latest Openings: Delhi Subordinate Services Selection Board is the official name of the Delhi government job selection board.From this board only we can expect the Delhi government job recruitment notifications.Present this board is completely occupied with the latest recruitment notification of various posts like PGT, TGT, Asstt. Teacher & Other Posts with 9232 vacancies.So waiting candidates for Delhi check the notification if you are ready to Apply Online 9232 Vacancies at the official website @dsssbonline.nic.in.As the posts are various, so we have given the advt number so that it will be easy for the applicant to identify that this is the latest recruitment of DSSB. Qualification Details: M.Sc., B.Sc., B.Ed. Qualification Details: Master’s Degree or Degree / Diploma in Training /Education. An alternate method of application submission is not at all adopted by the DSSSB. So it strictly conveys that online submitted applications only accepted by the officials from the applicants to select for the selection rounds.In case if you are failed to submit the online application form on or before 31st Jan 2018, then you can lose this good opportunity. Then don’t lead that way. Apply as soon as possible from 05th Jan 2018 onwards.